Ten candidates from across the country will receive skills development and training for association leadership. NPMA is proud to announce the selection of the association’s Executive Leadership Program (ELP) inaugural class of participants, marking an important strategic step toward cultivating a representative pipeline of candidates for leadership opportunities within NPMA for years to come. The ten candidates of the ELP’s inaugural class were selected through a rigorous application process, which vetted more than 40 applications from across the country. Applicants were selected based on broad criteria, which accounted for leadership potential, industry participation and commitment to professional development, among other factors. NPMA has been following an ongoing incident that occurred in Amarillo, Texas this weekend, resulting in the death of four people. News outlets are reporting that the deaths were the result of accidental poisoning by phosphine gas by the homeowner. NPMA has been in touch with EPA and has reached out to the Texas Department of Agriculture when we first learned of the incident. NPMA will be coordinating with the Texas Pest Control Association and will provide additional resources as they become available. 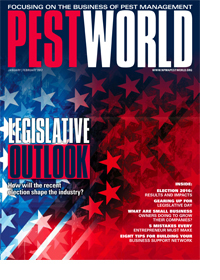 Should you have questions at this point please contact us at publicpolicy@pestworld.org. Your digital edition of PestWorld – January/February 2017 is available now! NPMA Webinar Series: Insect Pest Management on Landscape Plants - Does This Matter for Structural Pest Managers? 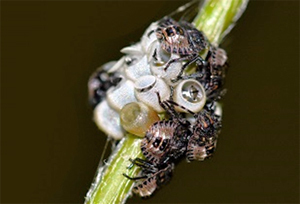 In this webinar, Dr. Adam Dale will cover the fundamentals of integrated management of arthropod pests on turfgrass and ornamental landscape plants around the home. Many of the same principles apply to managing plant pests and structural pests. However, we have a poor understanding of how one may affect the other. Here, we will discuss these relationships and review recent research that may shed light on how we can address this grey area in pest management. There are only 8 DAYS left to take advantage of early bird pricing, so register today! Prices will increase after January 11. 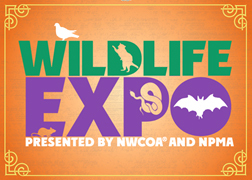 Join NPMA and the National Wildlife Control Operators Association (NWCOA) on February 4-6 in Memphis for a one-of-a-kind program offering the most current technical and business-related information to professionals who are involved in wildlife management or are considering offering this valuable add-on service. ABC Pest and Lawn Services is proud to announce that their field staff is 100% QualityPro certified. Additionally, ABC has received the 2016 Angie’s List Super Service Award for the 12th year in a row.